After installing accounting and financial software in the US and the Bahamas, Dan and wife Kathy came to New Zealand by yacht. They now trade as Financial Systems Group (FSG) and have based the business at Kathy’s alpaca farm in Northland. The pair say they now supply accounting and point of sale systems to ‘Mom and Pop’-style small firms, along with other businesses nationwide. Although he began as a flight instructor, Bloom’s background in the financial services sector stands him in good stead for his current job. He is a former partner at KPMG, where he began working as an intern in 1970, and he is an accountancy graduate of the University of West Florida. He has also worked in management consulting, specialising in local government systems. “The combined accounting background, together with the computer auditing, blended perfectly with the skills needed to implement systems,” he says. KPMG offered Bloom a transfer to New York, but he and Kathy wanted to sail around the world instead, so he began the journey by moving to work in the Bahamas. More sailing then took the couple around South America and back to the Bahamas, where Bloom spent 10 more years with KPMG working on systems consulting and development. The family then spent six months touring New Zealand before deciding to settle here with their daughter. They bought a 13-hectare farm that now houses more than 100 alpacas. Bloom was offered teaching work at Northland Polytechnic and later became a tenured lecturer there. However, he wanted to return to systems installation and formed FSG in 2002. He finds Northlanders typically need a $500 implementation of shrink-wrapped software rather than a major installation, so sells Quickbooks software along with Kudos Solutions’ Counter Intelligence or Quickbooks’ point of sale software. 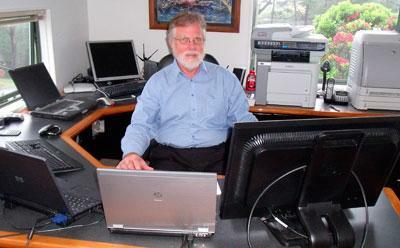 He is also an MYOB business partner and certified implementation professional. Today, the company has a client base from Warkworth to Kaitaia, with most centred around Whangarei. Bloom is the sole staff member, but calls on associates from Auckland or further away when he needs specialist help. He works from a home office with six computers, saying he thought of an office in town but was discouraged when he found there was no sea view. His biggest challenge running FSG has been adapting from large corporate and government projects where he can bill for every hour, to smaller schemes where the customer expects installation and support to be included. Here, remote access is invaluable, he says. Bloom is cautious about the future for his company, saying the recession is not yet over and customers are demanding “more for less”. He says 2010 saw a significant decline in new implementations as people preferred to patch and mend old systems. Despite the hype over cloud and software as a service, Bloom is sceptical, saying the few customers he has migrated to the cloud have “returned to earth” due to problems with internet speeds or user support from the cloud provider. “Quickbooks or Recon have had a Saas product for the past year. The product is excellent - sitting on a multi-million dollar mirrored platform sited at various physical sites in Australia. It is the dependency of all of the various providers that cause the issue,” he says. When not working, Bloom relieves his stress by working on his tractor. He recommends travelling while young enough to make the most of it.